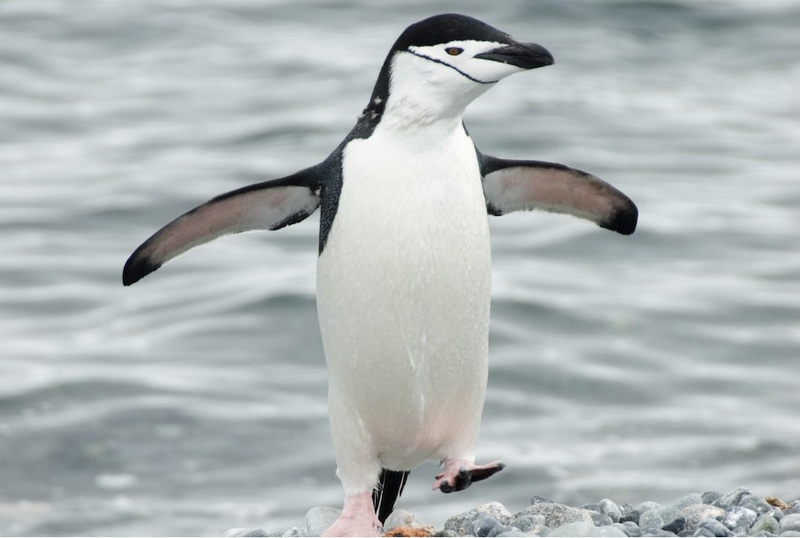 The chinstrap penguin, also known as ringed penguin, bearded penguin amongst others, is one of the most easily recognizable of penguins. 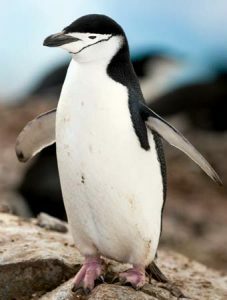 It is distributed between the populations of the Adelie penguin and gentoo penguin. 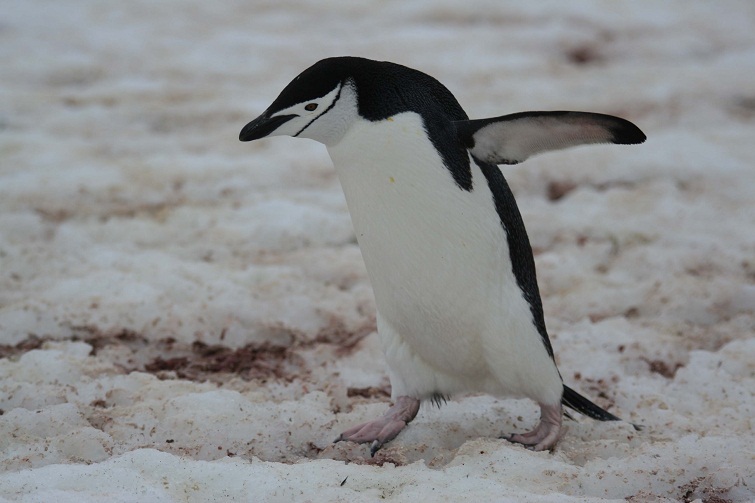 The chinstrap’s short legs give it a distinct and amusing waddle when it moves on land. Size: Chinstrap penguins reach a height of around 28 in (72 cm). Weight: They weigh between 6.6-11 lbs (3-5 kg). Color: White front body, throat and face, a black back, head and bill, there is a narrow black band which runs from behind the eyes and meets at the chin, thus earning the bird its name. The legs and feet are pink. Sexual Dimorphism: Male chinstraps are heavier and larger than females. 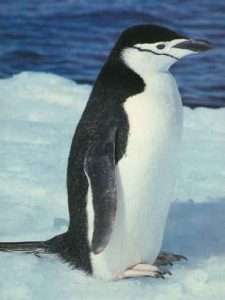 Chinstrap penguins inhabit Argentina, the Falkland Islands, Antarctica, Bouvet Island, Chile, South Georgia, the French Southern Territories, and the South Sandwich Islands. Nomad populations have wandered off as far as New Zealand, South Africa and the island of Saint Helena. 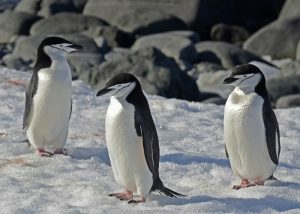 They live on rocky islands in the Antarctic Ocean. 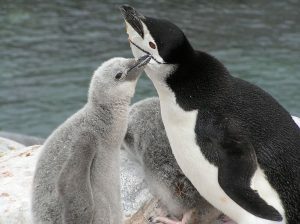 They are very social and stay together in colonies consisting of hundreds of thousands of pairs. 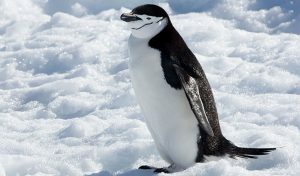 They are one of the most aggressive of all penguins. They are loyal to their colonies and return to the site every year during the breeding season. Once they have congregated into their colonies, they form breeding pairs. The bond between such pairs is rather affectionate. 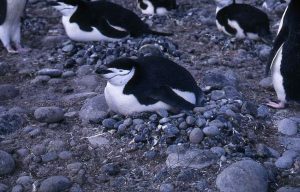 The female lays two eggs in late November and early December, which are then incubated by both parents in the circular nests they build out of stone. The incubation period lasts for about 35 days. Unlike some penguins, chinstraps raise both their offspring equally. 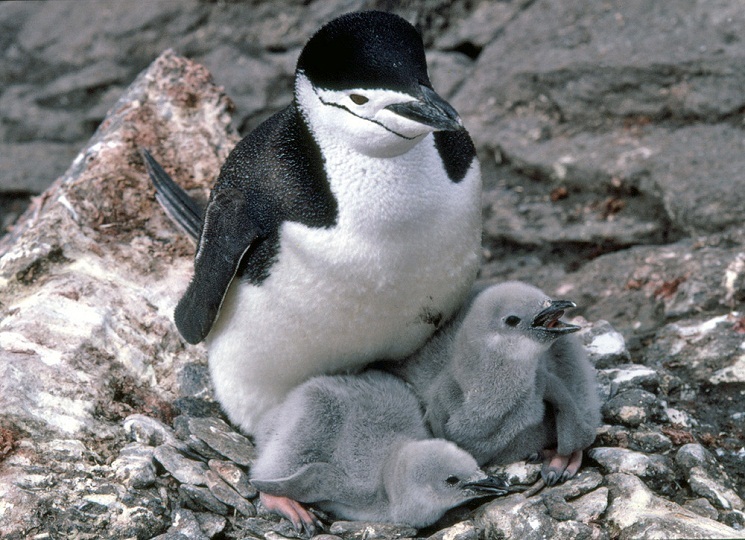 The chicks remain in the nests for around a month before going off to a crèche. They obtain their adult plumage after their first molt, which occurs when they are about 50-60 days old. They reach sexual maturity between 3 and 7 years of age. They live for around 15 to 20 years. 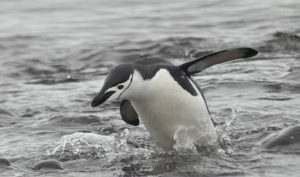 Some of the most common methods of communication used by chinstraps are flipper and head waving, bowing, gesturing, calling, and preening. Colonies synchronize their breeding cycles by partaking in a loud screeching ritual. 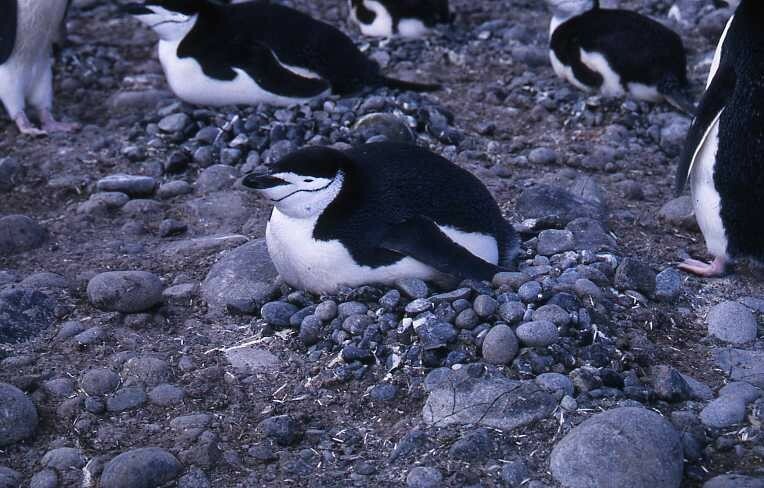 The shrillness of their high-pitched calls earns them a nickname, stone-cracker penguin. Chinstraps eat small fish, crustaceans, and krill. The plumage helps them become inconspicuous in the water. From above the black back blends in with the darkness of the sea floor and from below the white blends in with the sunshine above. Closely packed feathers aid in withstanding the freezing waters in which they swim. A thick layer of fat under the feathers, called blubber helps as a storing energy and provide insulation. The flippers and webbed feet make the chinstrap an excellent swimmer. Their primary predator is the leopard seal. Brown skuas and sheathbills sometimes prey on the eggs and chicks. Their large and widely distributed population ensures their safety for the foreseeable future. There is an estimated worldwide population of at least 8 million chinstrap penguins. Thus they are listed under the ‘Least Concern’ category by the IUCN. Possibly the two most famous chinstrap penguins are Roy and Silo, two male captive individuals from Central Park Zoo in New York City. 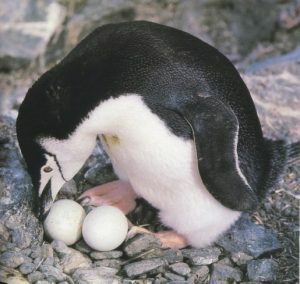 They developed a strong bond with each other and proceeded to hatch a rock, which was later substituted with an actual fertile egg that did hatch, and a female chick was born.